Hey, Durhamites! Do you love this city as much as we do? I’m Katelyn Belch, founder of Best of the Bull and I get asked pretty often if we are looking for any writers for our site. Truth is, we are always looking for genuinely kind and fun people to join our team or if you even have 1 story you want to share! You don’t have to be a professional writer. If you have a passion for Durham and can string together a good review then we want you! With the reach level Best of the Bull has, we are invited to some of the coolest things in town. Music concerts to grand openings, events, private parties, you name it. An abundance of free food and drinks are usually involved as well as awesome experiences. Our team of contributors will get first right of refusal on all our invites. As a contributor, your bio will appear on our About page, with a link to your social media account or website if you like. 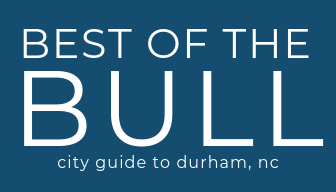 We just ask for at least one article a month about stuff like things to do in Durham, a local business, new developments, an event, a cool history lesson, etc. Q. Do I get paid for the articles? A. Not right now…but maybe. We all volunteer to do this because we love the city of Durham and want to share about it. We want to stay objective in all that we write and share about. But we gotta keep the lights on too so we’re working on obtaining some sponsored content opportunities for our contributors as well. Q. So, is there any way for me to earn money by working as a contributor for Best of the Bull? A. YES! Any contributor who brings in a sponsor will receive 50% of whatever the sponsor pays each month for the first sponsor, as long as they remain a sponsor of the BOTB, and 20% of any additional sponsors they bring in. Plus, some sponsored content opportunities may be available to you once you’re an established contributor. Know an awesome local business? Reach out to them and see if they want to partner with us. Q. What is the average time commitment for writing one article per month? A. The short answer is probably 1-2 hours per month, depending on your writing speed and the preparation required for your article. But figure it this way. You are going to be out and about in Durham anyway. Snap a few shots, do a quick interview and write 300+ interesting words. Then send them to us and that’s it! Introduce yourself. Tell us about who you are and why you’d like to write for Best of the Bull. Have fun with it and show us your personality. We just need one paragraph. Include Your Social Links. Facebook profile, Twitter handle, Instagram. At this point you might say, meh, not interested. Even if we didn’t ask for this, you know we were going to look anyway. So you may as well submit your links and save us the step of tracking you down. We just ask that you run your article idea by us so we can make sure the concept will work for the site and that it’s not already being covered! Once you submit your first article we will bring you on as a contributor and you’ll be eligible for freebies from local businesses in exchange for write ups, some paid content opportunities, etc. Here’s how to get started: Submit a story via email to info@bestofthebull.com. Send it via a Word doc and attach photos separately — the more photos the better (large files sizes, we can always make smaller). Each submission is evaluated on a case-by-case basis. We do not pay for submissions and you retain the rights to everything you submit. We will be in touch within a few days if we’re able to publish.